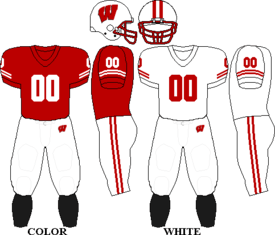 The Wisconsin Badgers football team is the intercollegiate football team of University of Wisconsin–Madison. The Badgers have competed in the Big Ten Conference since its formation in 1896. They play their home games at Camp Randall Stadium, the fourth-oldest stadium in college football. Wisconsin has had two Heisman Trophy winners, Alan Ameche and Ron Dayne, and have had nine former players inducted into the College Football Hall of Fame. As of December 3, 2016, the Badgers have an all-time record of 684–489–53. The first Badger football team took the field in 1889, losing the only two games it played that season. 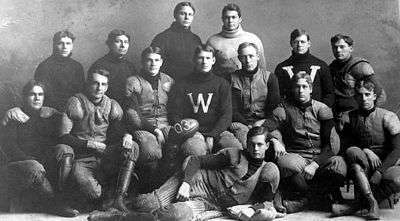 In 1890, Wisconsin earned its first victory with a 106–0 drubbing of Whitewater Normal School (now the University of Wisconsin–Whitewater), still the most lopsided win in school history. However, the very next week the Badgers suffered what remains their most lopsided defeat, a humiliating 63–0 loss at the hands of the University of Minnesota. Since then, the Badgers and Gophers have met 122 times, making Wisconsin vs Minnesota the most-played rivalry in the Football Bowl Subdivision. 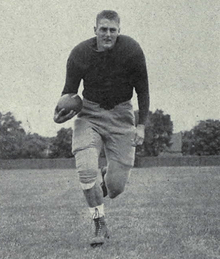 In 1962, the Badgers had another landmark season, spearheaded by the passing combination of Ron Vander Kelen to All-American Pat Richter. The Badgers standout victory was an upset of #1-ranked Northwestern, who were coached then by the legendary Ara Parseghian. The Badgers finished 8-1, earned their eighth Big Ten title, and faced the top-ranked USC Trojans in the Rose Bowl. Despite a narrow 42–37 defeat, the Badgers still ended the season ranked #2 in both the AP and Coaches polls (post-bowl rankings were not introduced until later in the decade). By the end of the 1989 season, the Wisconsin football program was in disarray, and loss of popularity, barely able to even get 30,000 fans coming to the 77,000-capacity stadium, Camp Randall Stadium, and shouldering a debt of over $2 million. New athletic director, Pat Richter, named Barry Alvarez, the defensive coordinator at Notre Dame, as the new head coach. To bring stability and interest in the program again, Alvarez targeted the top high school players in Wisconsin, "building a wall" around the state, and also encouraged players not recruited to join the program as walk-on's. Though Alvarez won his first game as head coach over Ball State, the Badgers finished 1-10 in 1990, but brought encouragement by following with back-to-back 5-6 seasons, including barely missing out on a bowl game in 1992. In 1993, the Badgers finished 10-1-1, winning their first Big Ten championship since 1962 and beat UCLA 21–16 to claim its first Rose Bowl victory. After the surprise success of 1993, the Badgers fell back into mediocrity, though they still remained competitive, going 2-1 in bowl games from 1994-1997, with victories in the Hall of Fame Bowl in 1994, and the Copper Bowl in 1996. Alvarez was able to retool the team with a new batch of talented recruits during this stretch of seasons, and they came to full fruition in 1998 and 1999. Among the standouts on the Badgers included corner back Jamar Fletcher, wide receiver Chris Chambers, quarterback Brooks Bollinger, offensive linemen Aaron Gibson, Chris McIntosh, and Mark Tauscher, and their signature star player, running back Ron Dayne. With "The Great Dayne" leading the way, the Badgers won back-to-back Big Ten championships, and won back-to-back Rose Bowls over UCLA in 1999, and Stanford in 2000. Ron Dayne set a new NCAA record for career rushing yardage, and won the Heisman Trophy in 1999. Going into 2000, there were high hopes of the Badgers winning their third Big Ten championship in a row, with the possibility of winning an unprecedented three straight Rose Bowls. However early into the season, Wisconsin's football and basketball programs were hit with controversy in what became known as "The Shoe Box scandal", where a local shoe store gave university athletes over $23,000 in discounts for footwear. Wisconsin athletic programs, including football, were put under 5 years of probation, and several players were suspended by the NCAA. The Badgers had a down season, finishing 9-4, with a victory over UCLA in the Sun Bowl. Hurt by the NCAA's probation, the Badgers struggled through the 2001-2003 seasons, never finishing higher than 7th in the Big Ten. By 2004, with the probation ending, Alvarez was able to rebuild the program, and the Badgers returned back to the top 20 in the AP polls in 2004 and 2005, with a victory in the Capitol One Bowl in 2005. In 2004, Barry Alvarez was named athletic director, replacing the retiring Pat Richter. The strain of working as athletic director and head coach became too much for Alvarez, and he announced that he was stepping down as head coach after the 2005 season. Alvarez coached the Badgers for 16 seasons, finishing with a 118-73-4 record during those seasons, three times finishing in the Top 10 in the AP polls, and the only Big Ten head coach to win back-to-back Rose Bowls. Following the 2005 season, Alvarez resigned as head coach in order to focus on his duties as athletic director, a position he had assumed in 2004. He named his defensive coordinator, Bret Bielema, as his successor. From 2006 to 2011, Bielema led the Badgers to six consecutive bowl appearances, going 2–4. In 2010, the Badgers won a share of the Big Ten Championship and returned to the Rose Bowl for the first time since 2000. There they were defeated 21–19 by the #3 ranked TCU. In 2011, the Badgers were once again crowned Big Ten Champs when they defeated Michigan State in the first-ever conference championship game. The victory sent Wisconsin back to the Rose Bowl for a second consecutive year, where they were defeated by the Pac-12 champion Oregon Ducks, 45-38. The 2012 season ended with the Badgers winning a third consecutive Big Ten title. Despite finishing with a 7-5 record and third in the Leaders Division, the Badgers advanced to the Big Ten Championship game by virtue of the fact that Penn State and Ohio State were ineligible for postseason play. A dominating rushing performance led Wisconsin to a 70-31 victory over #12 ranked Nebraska in the Big Ten Championship game. Only days later, Brett Bielema resigned to become the head coach of the Arkansas Razorbacks. Gary Andersen, formerly coach of Utah State University, was named head coach on December 19, 2012. At the request of the team captains, Barry Alvarez named himself interim coach for the 2013 Rose Bowl, where the Badgers lost, 20-14 to Stanford. Andersen departed Wisconsin four days later, taking the vacant head coaching position at Oregon State. Andersen cited family as his rationale for taking the Oregon State position; however, it was reported by some media outlets, such as Fox Sports and Sports Illustrated, that Andersen was frustrated with the University's high academic standards for athletes. Those reports turned out to be accurate, and were confirmed by Andersen in January 2015. Andersen had to pay a $3 million buyout for departing within the first two years of his contract, which was set through January 2019. At the request of the teams' seniors, Barry Alvarez named himself interim coach for the 2015 Outback Bowl vs. Auburn on January 1, 2015. 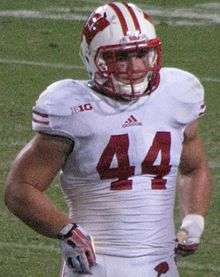 Wisconsin won the game 34–31 in overtime. After the departure of Gary Andersen former Badgers offensive coordinator (2005-2011) and Pitt head coach (2012-2014), Paul Chryst, was hired as the next head coach of the Wisconsin Badgers. The only assistant coach to remain on the coaching staff after Andersen's departure was defensive coordinator Dave Aranda. Chryst brought over six coaching staff from the University of Pittsburgh, Joe Rudolph (OC), John Settle (RB coach), Inoke Breckterfield (D-line), Chris Haering (special teams), Mickey Turner (TE coach) and Ross Kolodziej (strength and conditioning). From 2005 to 2011 Rudolph (TE coach) and Settle (RB coach) were assistant coaches under Chryst (OC). Mickey Turner and Ross Kolodziej are both former Badgers players, Turner was a tight end from 2006-2009 and Kolodziej was a defensive tackle from 1997-2000. Aranda was replaced with Justin Wilcox, who was previously USC's defensive coordinator from 2014 to 2015, he was fired in early December 2015 after the Trojans finished 50th nationally in scoring defense (25.7 points per game) and 65th in total defense (400.8 yards per game). The Badgers started 2016 on a high note by upsetting the #5 ranked LSU Tigers 16-14 in their season opener at Lambeau Field, the first ever major college football game in the historical stadium. The Badgers have appeared in 27 bowl games and have a record of 13 wins and 14 losses (13–14). Their most recent bowl game was in the 2015 Holiday Bowl. 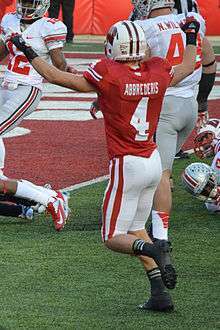 The Badgers have participated in a season-ending bowl game 14 consecutive seasons and snapped a four-game bowl losing streak with a 34–31 overtime victory over Auburn in the 2015 Outback Bowl. 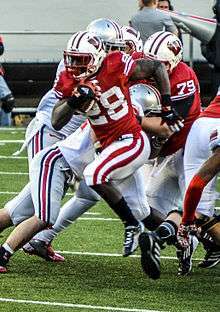 "Running Back U" is a nickname that has emerged during the regime of Hall of Fame college football coach Barry Alvarez ('90–'05) and continued by his successors. Running plays have become a staple of the Wisconsin offensive attack ever since. The Badgers have produced a number of top-rated players at the running back position, including two Heisman Trophy winners and three Doak Walker Award winners. Standouts have included Howard Weiss, Elroy "Crazy Legs" Hirsch, Alan Ameche, Joe Dawkins, Rufus "Roadrunner" Ferguson, Brent Moss, Terrell Fletcher, Ron Dayne, Michael Bennett, Anthony Davis, Brian Calhoun, Montee Ball, James White and Melvin Gordon. 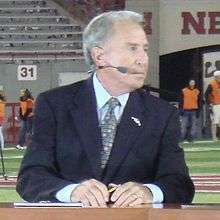 Lee Corso has worn the Badger head gear on 6 occasions. The Badgers have appeared on ESPN's College Game Day 14 times since 1999, with 3 bowl appearances. Wisconsin is 5–9 in games played when College GameDay has traveled to Badger games. Wisconsin has hosted the program 5 times. The most recent visit came in 2016 when Ohio State played in Madison. The Badgers have a 3–3 record when Gameday is on campus. 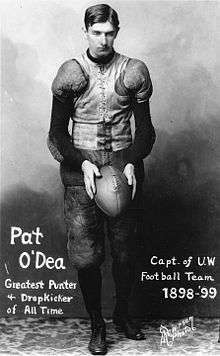 The UW-U of M series is the nation’s most-played rivalry in Division I football and has been played continuously since 1907. Much prestige was always associated with the game, and the significance was emphasized with its place on the schedule. Between 1933 and 1982, the Wisconsin-Minnesota game was always the final regular-season contest for each school. The series took an added twist in 1948 when more than state bragging rights were on the line. 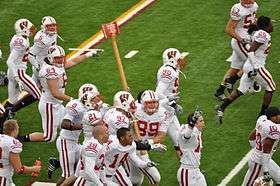 After a 16-0 setback that season, the Wisconsin lettermen's group, the National 'W' Club, presented Minnesota with an axe wielded by Paul Bunyan. He was the mythical giant of Midwestern lumber camps. Each year since, the winner of the annual battle between the Big Ten rivals is presented with the axe, complete with scores inscribed on the handle, for display on its campus. Series is tied 59-59-8. Iowa is Wisconsin's other archrival. Although the rivalry started in 1894, the Heartland Trophy was inaugurated in 2004 and goes each year to the winner. The trophy was designed and crafted by artist and former Iowa football player Frank Strub. The trophy, which is a bull mounted on a walnut base (native to both Wisconsin and Iowa), has been inscribed with the scores of all games in the long-time series. With Big Ten expansion, the Wisconsin and Iowa football teams were placed in separate divisions, thus ending their annual rivalry. However, with the addition of Maryland and Rutgers, Iowa and Wisconsin were placed back in the same division in 2014. Wisconsin leads the series at 44-43-2. Nebraska is Wisconsin's newest rival. With the inclusion of the Cornhuskers in the Big Ten in 2011 the first three games between the two programs were significant, the third being the 2012 Big Ten Football Championship Game where the unranked Badgers defeated the heavily favored #14 ranked Cornhuskers, 70-31. Prior to their next matchup in 2014, the University of Nebraska and the University of Wisconsin announced that moving forward the two schools would play for the Freedom Trophy. The trophy sits on a wooden base and features a depiction of Nebraska's Memorial Stadium on one side and Wisconsin's Camp Randall Stadium on the other. The trophy has an inscription honoring the nation's veterans and symbolizes that Memorial Stadium was built in their honor at Nebraska while Camp Randall Stadium in Wisconsin was built on the site of a former Civil War training site. The score of each year's contest will be inscribed on the trophy. Wisconsin leads the series 4-1-0. In 2015 the Big Ten announced that starting in 2016 it will no longer allow its members to play Football Championship Subdivision teams, and will also require at least one non-conference game against a school in the Power Five conferences (ACC, Big 12, Pac-12, SEC). Games against FBS independents Notre Dame and BYU will count toward the Power Five requirement. Any game schedule prior to the announcement were allowed to stay on the schedule. * The 2016 game against LSU will be played at Lambeau Field in Green Bay, Wisconsin. ↑ Statistics correct as of 2014 NCAA Division I FBS football season. ↑ "Athletics Style Guide". 2015-10-26. Retrieved 2016-08-04. ↑ "Wisconsin Historical Data". cfbdatawarehouse.com. ↑ "Paul Bunyan's Axe". The Official Website of Minnesota Athletics. Retrieved August 12, 2009. ↑ Rittenberg, Adam (December 5, 2012). "Report: Alvarez to coach UW in Rose Bowl". ESPN.com. Retrieved April 8, 2014. ↑ "NCAA College Football Recap - LSU Tigers at Wisconsin Badgers - Aug 30, 2014 - CBSSports.com". CBSSports.com. 31 August 2014. ↑ "Wisconsin Badgers Football, Basketball, and Recruiting Front Page". scout.com. ↑ "Nebraska Cornhuskers vs Wisconsin Badgers - Recap". ESPN.com. ↑ "Badgers Suffer Big Ten Title Game Beatdown, 59-0". Fox Sports Wisconsin. Associated Press. December 6, 2014. Retrieved December 9, 2014. ↑ "Oregon State hires Wisconsin's Gary Andersen - CollegeFootballTalk". nbcsports.com. ↑ Hamilton, Brian (December 10, 2014). "Wisconsin must look at commitment as Andersen moves to Oregon State". Sports Illustrated. Retrieved December 11, 2014. ↑ Temple, Jesse (December 11, 2014). "Academic admissions an issue at Wisconsin, but Andersen should have known better". Fox Sports Wisconsin. Retrieved December 11, 2014. ↑ Potrykus, Jeff (December 11, 2014). "Did Oregon State opening distract Gary Andersen in Big Ten title game?". Milwaukee Journal Sentinel. Retrieved December 12, 2014. ↑ Channel 3000. "Alvarez to coach Wisconsin in bowl vs Auburn". Channel 3000. 1 2 "Auburn Tigers vs Wisconsin Badgers - Recap". ESPN.com. 1 2 3 "Wisconsin vs. Minnesota series record". cfbdatawarehouse.com. Retrieved February 21, 2014. ↑ Kohlbeck, Eric. "WISCONSIN'S JUMP AROUND: 'FANS HAVE MADE IT WHAT IT IS'". Campusrush.com. Retrieved 1 December 2016. ↑ "Celebrating Lee Corso's 250 headgear picks". ESPN. October 31, 2014. ↑ Flaherty, Tom (November 13, 1994). "Never A Star, No. 83 Left Mark At Wisconsin". Chicago Tribune. Retrieved November 23, 2014. ↑ "Shafer's Jersey Number to be Retired". University of Wisconsin. Retrieved November 23, 2014. 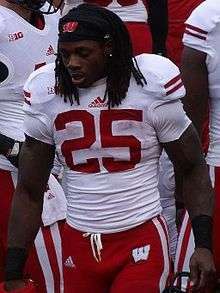 ↑ "Abbrederis named winner of Burlsworth Trophy - UWBadgers.com - The Official Athletic Site of the Wisconsin Badgers". uwbadgers.com. ↑ McGuire, Kevin (July 31, 2015). "New Big Ten scheduling mandates Power 5 opponents, no FCS foes". College Football Talk. NBCSports.com. Retrieved July 31, 2015. 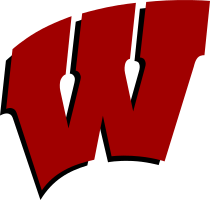 ↑ "Wisconsin Badgers Football Schedules and Future Schedules". fbschedules.com. Retrieved August 23, 2014. ↑ "Badgers football: Complete list of former Wisconsin players on NFL rosters". May 11, 2016. Retrieved May 11, 2016. ↑ "UWBadgers.com - The Official Athletic Site of the Wisconsin Badgers - Football". uwbadgers.com.